yoga4cancer (y4c) is a specialized yoga methodology that is tailored to address the specific physical and emotional needs left by the cancer & its treatments. This unique evidence-based approach is not just gentle or restorative yoga but focuses on how to stimulate the immune system through movement, improve flexibility & strength along with reduced anxiety and boost overall well-being. 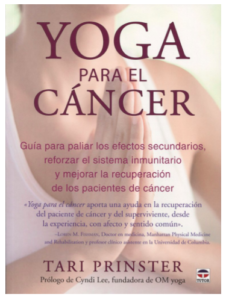 y4c was developed by Tari Prinster – a cancer survivor, master yoga teacher and author of “Yoga for Cancer’. Tari has offered teacher trainings, classes and retreats around the World for the past 15 years. More than 2100 y4c trained teacher have joined the y4c community to help those touched by cancer find happier, healthier and longer lives. yoga4cancer is a prescription for and available to all those touched by cancer. Visit y4c’s website by clicking here! 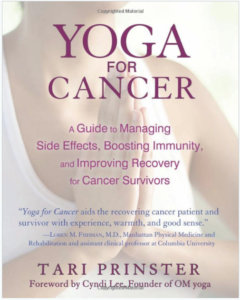 In the 5-Star Amazon reviewed Yoga for Cancer, Tari Prinster shares her personal and professional experience in using yoga to manage the challenges of cancer and its treatment.